In a city that's obsessed with food, it comes as no surprise that there's a culinary event of some kind happening nearly every week of the year. From the world of fine chocolates and cheeses to superfoods and veganism, here’s a calendar of delectable festivals, seminars, and competitions to attend through April 2017. We'll update this calendar throughout the year as more events are scheduled. Chocolatiers from around Quebec are joining forces for a weekend full of chocolate lectures, chocolate tastings, a chocolate fashion show, chocolate cocktails, and... Pharmacy valentine chocolates are so passé; spend this Valentine’s Day weekend with real, artisanal chocolate, surrounded by chocolate, maybe with a date made of chocolate. No judgement. Montreal en Lumière is back for its 18th edition of performing arts, fine dining, and, of course, the all-day-and-night dance party, Nuit Blanche, which draws in 350,000 partiers every year. But, let’s get real and talk about the food. The culinary aspect of this year’s event will highlight the cuisine of Lyon, France where several restaurants like Le Margaux, Chez Chose, Mercuri, Le Quartier Général, and État-Major have created special fixed-price menus inspired by the French city. Imagine a place where more than 60 Quebec-made cheeses under one roof are waiting to be paired with wine, beer, and cider. Now, imagine that all that wonderful, stinky fromage is free. That’s exactly what awaits you at Montreal’s Cheese Festival. We're truly sorry to all those who are lactose intolerant. Rockabilly and swing music will be the soundtrack for your weekend at La Cuvée d’Hiver. Located at Salon 1861, the event will introduce you to over 200 products from local brewskis to various whiskeys and plenty of grub. All of the event’s whiskey vendors will be there on Thursday, March 2, so that’s the day to go if you’re a whiskey lover. Sparkling, sweet, fire, flavored, and iced -- ciders are a varied bunch and all of them can be found at Montreal’s Cider Festival. Quebec cider makers will be setting up tastings, blind and otherwise, and preparing pairing stations that include oysters, foie gras, cheese, and more delicacies. Quinoa, Chia et Amarante: Miracle Grains? Raise your hand if you really know what the dietary difference between quinoa and chia is... That's what we thought. If you're still on a healthy eating kick, learn the difference between three grains and what makes them so healthy during a seminar. After, sample dishes made with each discussed, including amarante, another fancy plant that people are eating these days. Bringing a slice of Scandinavia to Montreal is Fika(s) Festival, named after the Swedish term for a coffee break. Minus the dreamy fjords, hordes of blondes, and heaps of Norwegian trolls, Fika(s) will feature Scandinavian cinema, music, and incredible food like smoked salmon and game meat dishes. This week is all about the carbs and cheese. During this week, your favorite childhood meal grows up with toppings like lobster, foie gras, pulled pork, and more. Several restaurants around the city like Le Cheese and Pub BreWskey are currently hard at work creating wondrous mac & cheese dishes in their culinary laboratories. 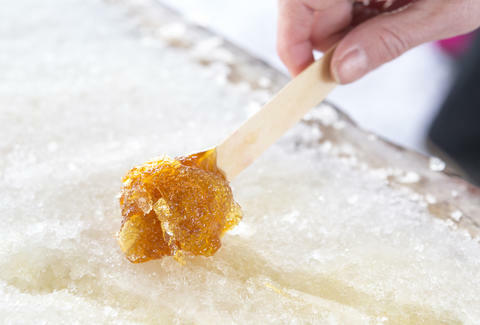 For the seventh edition of Cabane Panache et Bois Rond, Wellington St will be full of traditional Quebecois music, activities, and twists on sugar shack staples to help you celebrate the maple season. Dancing, log throwing, two-man sawing, and an onsite barber awaits, but nothing will top the cabane à sucre-themed dishes, brought to you by local restaurants of Le Sud-Ouest. Whether you’re a vegetarian, vegan, or interested in becoming one of the two, this event is the place to get the scoop on eating clean and green. Taking place at Palais des Congres, more than 280 exhibitors will be giving out samples, information on supplements, and healthy recipes that will make it easy for anyone to become meat-free. Sign up here for our daily Montreal email and be the first to get all the food/drink/fun in the City of Saints.